Cancun Adventures offers unforgettable travel experiences, including Chichen Itza private tours. Learn about the benefits of a guided tour in Chichen Itza, Mexico. Chichen Itza, Mexico is being added to an increasing number of travel wish lists every day. Its beauty and cultural history draw crowds year-round, which means Chichen Itza private tours are the best way to ensure you get to see and do everything. Knowledgeable and certified tour guides will teach you about the ancient Mayan people, customs, beliefs, and architecture while expertly navigating the ruins. You’ll also enjoy the incredible photo opportunities and the grandeur of experiencing one of the New 7 Wonders of the World. What was once a populous Mayan city and a busy trade center is now a collection of breathtaking ancient ruins. It is estimated that Chichen Itza is over 1500 years old! The iconic El Castillo, the 98-foot pyramid in the center of the city, is surrounded by residential buildings, The Great Ball Court, and several other temples, pyramids, and structures. Due to ongoing preservation efforts, El Castillo cannot be climbed but is still a sight to behold, especially during the spring and autumn equinoxes, when the sun and shadows create the illusion of a large serpent descending the pyramid. Visiting iconic sights in foreign countries can be a bit overwhelming if you plan to go it alone. Guided tours provide unique advantages. Insider Info: Expert tour guides know the best routes, views, photo spots, and souvenir shops, plus all the fun facts and information. You Can Ask Questions: If there is anything you are curious about while visiting the site, the guides can answer questions for you. See and Do More: Traveling without a guide means missed opportunities. Tours often include more than one activity or destination. Maximize Time: Tours are carefully planned to include everything in a designated amount of time, which can allow you to fit more into your trip. Cancun Adventures offers two different Chichen Itza tours to accommodate different travel itineraries. Both tours provide transportation from Cancun and Playa Del Carmen in an air-conditioned van. Don’t forget to wear sunscreen and bring a camera! This express tour of Chichen Itza can be completed in one day trip and have you back to your hotel for the evening. 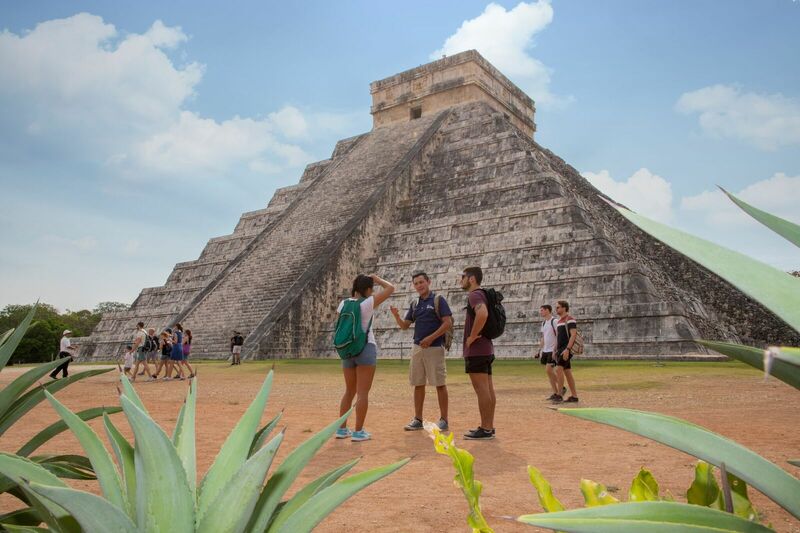 You’ll walk among the pyramids and ruins in a group with an expert bilingual tour guide and discover the fascinating history of the ancient Mayan civilization. Group travel is a wonderful way to meet new people and discover beautiful destinations. But some adventures are best enjoyed with your own private group — whether that is a small group of friends, family or a group from the office. We have the accommodations to tailor tours for your activities and groups! The Chichen Itza Private tour includes all of the comprehensive explorations of the express tour, but with a couple of notable additions. You’ll get to swim and cool off in a beautiful cenote, a natural sinkhole filled with crystal-clear water and surrounded by lush foliage. You’ll also make a stop at the village of Valladolid, where you can enjoy Mexican dining and explore the historic town. Get more information about our Private Chichen Itza Tour. For travelers looking to explore all the ancient Mayan ruins in the area or explorers who dream of climbing to the top of an ancient pyramid, there are other private tours available through Cancun Adventures. 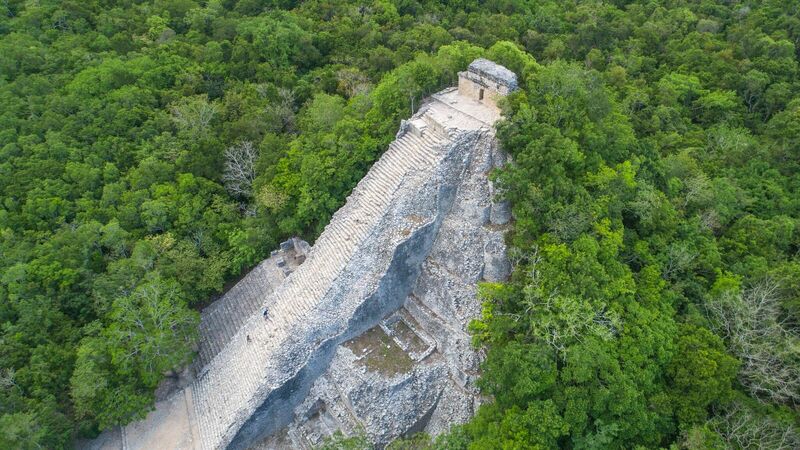 Check out the Express Coba Tour to visit the Coba ruins and climb Nohoch Mul, a 137-foot tall temple with an incomparable view. Or book our any of our Cultural tours to see the Tulum ruins, complete with a cliff-top castle (Castillo), and a partially restored mural in the Templo de las Pinturas. Cancun Adventures offers a variety of incredible tours and experiences for travelers in the Yucatan Peninsula. Check out more of our Cancun Adventures and start planning the perfect vacation. Don’t forget to include one of our Chichen Itza tours to complete your own unforgettable adventure in the heart of the Mayan Empire in Mexico.